The Character Design participants of the Feudal Japan Challenge were tasked with creating 8 different characters, each with their own story with their clothing, adornments, and gestures that draws us into the time, the people and the drama of the feudal society of Japan (1185-1603). Research for this portion of the challenge was especially important and the brief emphasized that women played a greater role than just being Geishas with female shogun. samurai, ninjas, emperors throughout the feudal period. Therefore, most of the character designs for the challenge were able to be male or female. With over 900 submissions, characters were judged on both creative and narrative details as well as anatomy, lighting, personality and silhouettes. 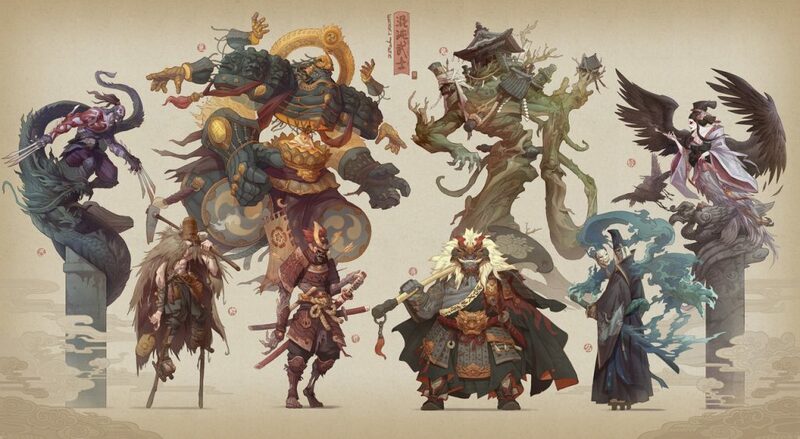 Browse all Character Design entries from the Feudal Japan Challenge. In this interview, the winners of the challenge, Hua Lu, Servane Altermatt and homas Chamberlain – Keen discuss their favorite designs, strategies and advice for future challengers. Which of your character designs for the challenge is your favorite and why? Hua: My favorite characters are the Samurai and Peasant. 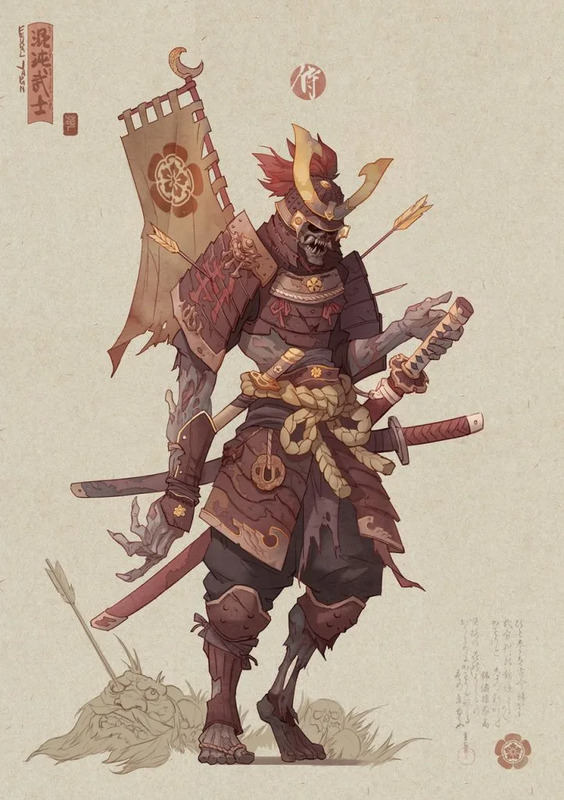 The Samurai is the first one and he is the cornerstone. I think the Peasant is also quite interesting. 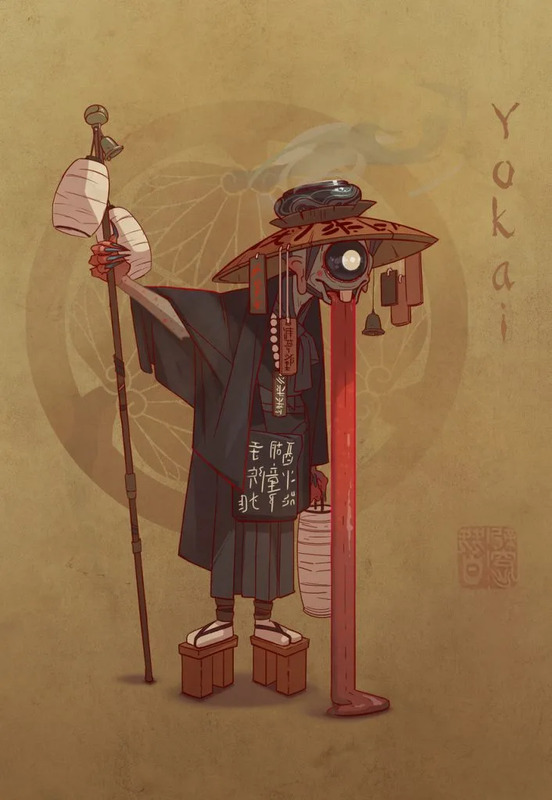 Servane: There are a few that I am happy with, like the peasant or the Shinobi, but I think my favorite one is the Yokai. I really had a lot of fun working on this one trying and to make him look creepy but kind of cute at the same time. It was an experience to read and learn a lot about Japanese mythological creatures. Thomas: It’s got to be the Shogun. 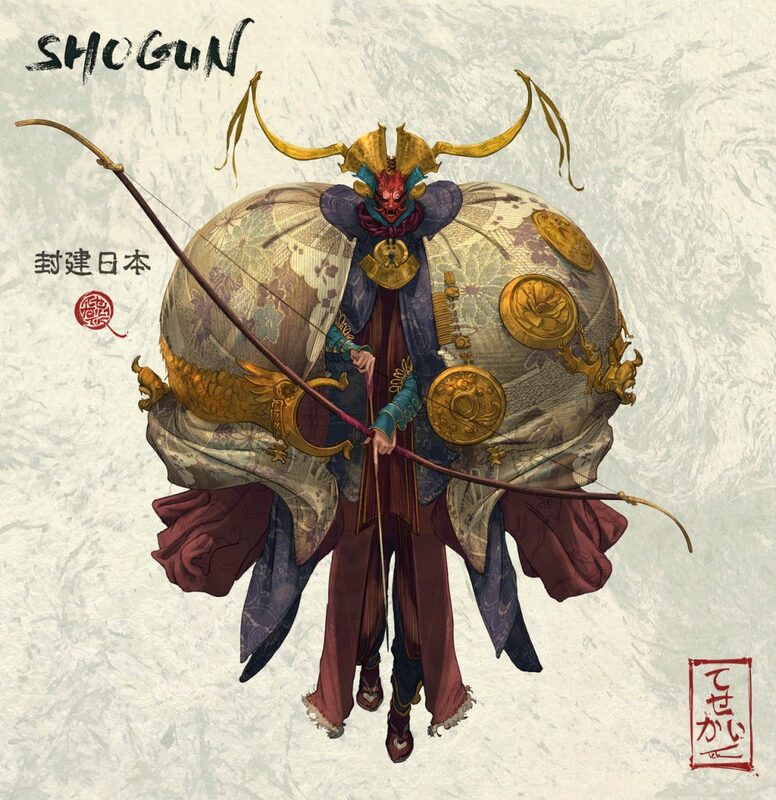 There was an underlying theme of insects in the shape design of my characters and the shogun, which is largely based on the moth, really used that motif to it’s fullest. The result feels very grandiose, self-important and yet surprisingly elegant. My Shogun was after all, female. What was your strategy for completing your submission on time? Hua: It was quite a rush indeed! My strategy was to first complete all the sketches before finishing any one of them. I also tried to be as specific as I could in the sketch step to minimize the uncertainty afterward. Secondly, I used my Samurai as the standard for the rest of the series in terms of like color palette, detail level, and other aspects. That really made creating other characters much more efficient and consistent. Servane: It was really challenging to complete the challenge this time again. First, I tried to determine some rough planning for each week of the challenge. I split the month into several phases corresponding to each part of the creation process. The first week I focused on doing research. I looked for references for my character designs and read a lot of texts about the Japanese Shogunate period. The second week I focused on sketches & silhouette iterations. I started to think about each character and his story, trying to find something that could make each of them unique. The third week I worked on the detailed design and final line art of each character. The last week I worked on finding the coloring style I’d like for the final line up of characters. I had to find an effective coloring style that would not take too long as I was running out of time. Thomas: Don’t stop and don’t look back. Only a few of my designs really went through large iterations. The rest I just kept developing as I went otherwise I knew the time to render them would run out. What was the most difficult part for you? Hua: Well, I think the most difficult part was to create a unique style that could also apply to the theme. You can see the Shogun theme from the first glimpse and it’s something original too. Servane: Time management was the most difficult. I had to use all my spare time (evenings & week-ends) and to sleep less for a month. I was totally exhausted at the end but really happy to have completed it! All the positive feedback I received from other ArtStation members really helped me stay motivated and keep moving forward in the challenge. Thanks a lot to them! Thomas: Finding the style of render that communicated the mood I wanted but that I could also complete in the time frame. This time I had to make use of photo texturing to achieve the rich details I wanted, as such the rest of my rendering approach was built up from there. What advice do you have for future challengers? Hua: It’s amazing experience to work with so many great artists. It’s really exciting. I think it’s a good idea to prepare for different situations. The better you’re prepared, the better you can handle it. You should also schedule every reasonable step. Stick to your plan! That’s the key to finish the competition in time. Servane: I’d recommend setting a plan at the very beginning of the challenge in order to set some deadlines for each phase of the creation process. I think it’s also important to work on all characters at the same time in order to ensure that they fit together as a line up. I encourage to regularly look at other participants work and share feedback with them. It’s always very interesting to see the process of other artists and sharing with the community helps staying motivated. Thomas: Try and plan ahead. Work out how long each stage of the task or each character is going to take you so you know you’ll have the chance to complete them all. Beyond time management, make use of the forum’s nature and constantly browse other peoples entries so you can make sure you stick out and maybe learn some tricks along the way.